For other uses, see Fur (disambiguation), Furs (disambiguation), and Pelt (disambiguation). 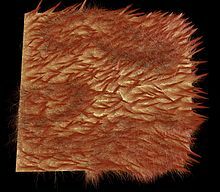 Other than the military, fur has been used for accessories such as hats, hoods, scarves, and muffs. Design elements including the visuals of the animal were considered acceptable with heads, tails and paws still being kept on the accessories. During the nineteenth century, seal[verification needed] and karakul were made into indoor jackets. The twentieth century was the beginning of the fur coats being fashionable in West Europe with full fur coats. With lifestyle changes as a result of developments like indoor heating, the international textile trade affected how fur was distributed around the world. Europeans focused on using local resources giving fur association with femininity with the increasing use of mink. In 1970, Germany was the world’s largest fur market. The International Fur Trade Federation banned endangering species furs like silk monkey, ocelot, leopard, tiger, and polar bear in 1975. 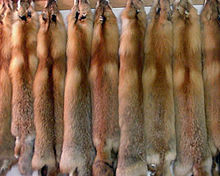 The use of animal skins were brought to light during the 1980s by animal right organisations and the demand for fur decreased. Anti-fur organisations raised awareness of the controversy between animal welfare and fashion. Fur farming became banned in Britain in 1999. During the twenty-first century, fox and mink have been bred in captivity with Denmark, Holland and Finland being leaders of mink production. ^ Bradley et. al, Brenda (2012). "Coat Color Variation and Pigmentation Gene Expression in Rhesus Macaques (Macaca Mulatta)" (PDF). Journal of Mammalian Evolution. 20 (3): 263–70. doi:10.1007/s10914-012-9212-3. Archived from the original (PDF) on 2015-09-24. Wikimedia Commons has media related to Furs. "Fur-Bearing Animals" . Encyclopedia Americana. 1920.